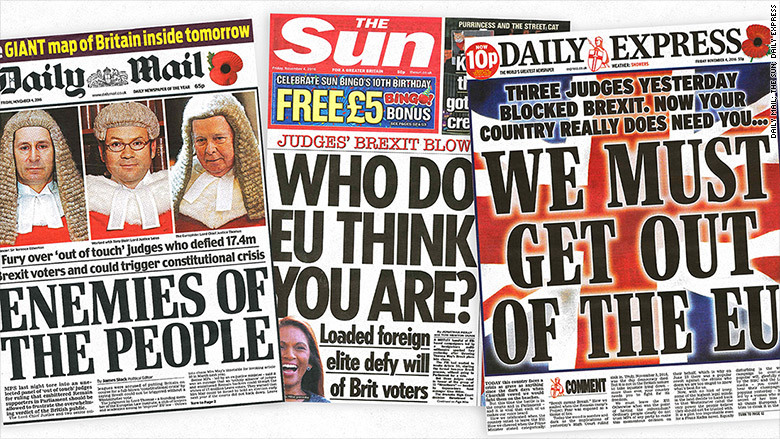 Britain's top selling newspapers are spewing hatred over Thursday's landmark Brexit court ruling. 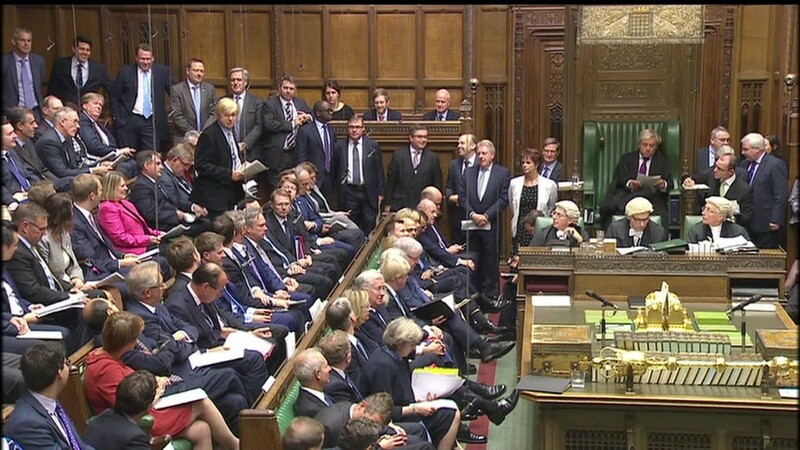 The verdict, which says simply that parliament must have a say in the process of withdrawing from the European Union, has put the government's plans in doubt. But the decision enraged pro-Brexit tabloids. Their front pages were filled Friday with attacks on the three senior judges who delivered it, as well as Gina Miller, the chief claimant in the case. The Daily Mail described the judges, who include the U.K.'s top two justices, as "Enemies of the people." The paper called one of the judges, Sir Terence Etherton, "an openly gay ex-Olympic fencer" in a headline, sparking a furious backlash on social media. The papers are the most popular in the U.K. The Sun sold 1.7 million copies a day in September, while the Daily Mail's circulation was 1.5 million. That compares with roughly 450,000 copies that The Times and The Telegraph sell, and The Guardian's circulation of 160,000. Miller became the target of racist attacks shortly after the ruling. The investment manager was born in Guyana when it was still a British colony and has lived in the UK for the past 41 years. For the tabloids though, her heritage appears to be a problem. In a front page headline next to an image of Miller, The Sun said "loaded foreign elite defy will of Brit voters." Comedian and writer David Schneider reacted to The Sun's headline by pointing out that the paper's owner, media mogul Rupert Murdoch, is also a "rich foreigner not born in this country." Most of the country's tabloids campaigned for Brexit ahead of the referendum and have since been dismissing anyone questioning the process as a "remoaner." The Daily Express, another anti-European tabloid newspaper, called on its readers to fight the court's decision. In a front page commentary, the paper called the verdict "a crisis as grave as anything since the dark days when Churchill vowed he would fight them on the beaches." It said: "Your country needs you more than ever because we must leave the EU. Rise up people of Britain and fight, fight, fight." Many found the papers' approach distressing. Brendan Cox, the husband of British MP Jo Cox who was murdered just days before the referendum, urged people to "take a step back and debate the court ruling soberly." "Inciting hatred has consequences," he said in a tweet. Whatever our views on the court ruling I hope we can take a step back & debate it soberly. Inciting hatred has consequences.